Keno is one of the most popular games in the entire world. 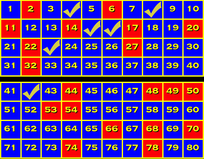 We have produced many free Keno apps for the iPhone, iPad, iPod touch and even the Mac. Click the title to the right that you want to learn more about. If you want to know some of the differences between iPhone Keno and Casino Keno, visit our page on the subject. Keno is a fun game of luck. Check out our numerous free keno apps today! If there are other keno apps that you would like us to develop, please don't hesitate to contact us and give us your suggestion. Here's more information about the game of Keno. -- Once you get our free iPhone Keno Games, make sure to add your review!